I am super impressed with Lakme's new range of products! 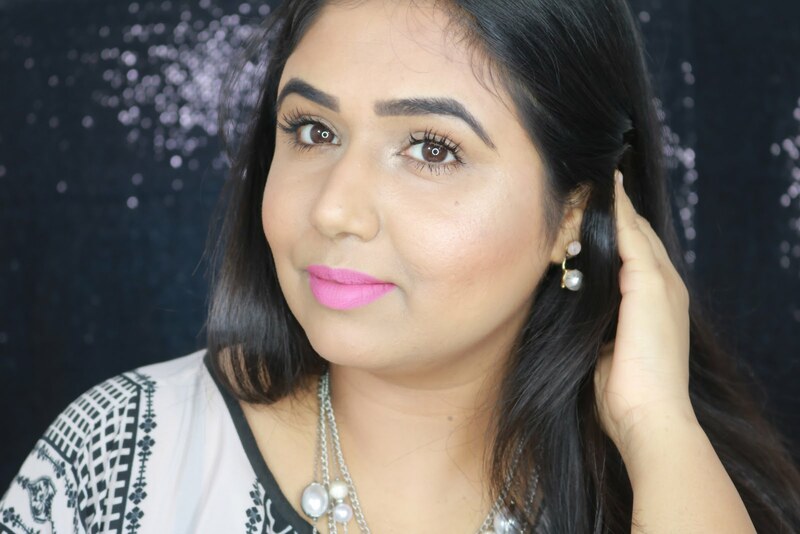 I have already reviewed their CC Cream which is fantastic for everyday day and today I'll be sharing with you another stunner Lakme Absolute Cheek Chromatic Baked Blush in the shade Day Blushes! Lakme Absolute Cheek Chromatic Baked Blush retails for 550 for 4g of product. So if you would like to know how I feel about this beauty keep on reading! Packaging wise its pretty nice and comes in black card board box packaging. The blush itself is packed in a round plastic tub with a see through lid. It's quite small and compact so would be perfect for travelling as well. The blush contains 4g of product which is quite decent for the price range. Lakme Absolute Chromatic Baked blushes comes in 4 different shades Day Blushes, Day Sheer, Night Sheen and Night Sparkle. The names are quite confusing and feels very random..just my personal opinion. The one I have is Day Blushes and its a gorgeous peachy pink shade with very subtle shimmer which is hardly visible but adds lovely glow to the cheeks! The blush is baked which means it can be used wet or dry, I have never used this wet so have no idea how it'll work. The texture is buttery smooth and blends very nicely on the cheeks, no patchiness at all. The pigmentation is good, I usually use my Real Techniques Blush Brush or my ELF Blush Brush and it picks up just the right amount of quantity. The shade is just amazing coral pink and is perfect for day time. Its not overly bright and adds subtle glow to the cheeks. The shimmer is absolutely subtle and hardly shows up as shimmer on cheeks rather it gives very subtle glow without looking OTT. With this blush you can definitely skip the highlighter! The most impressive thing about this shade is the staying power. Its one of the most long wearing shades in my entire collection and literally stays up to 10 hours! I have applied the blush 11 am in the morning and it was still very much visible with light fading when I removed my makeup at around 10 pm in the night! If you want a blush which is long lasting and would look great during day as well as night time I highly recommend this one! Its perfect for weddings or date night or even for outing with friends! Looks great in pictures and will suit all skin tones and types! Highly recommended!!! In terms of dupes and similarities the shade belongs to the same color family as theBalm Fratboy and Tarte Blissful. theBalm Fratboy is totally matte and a lot less brighter than Lakme Day Blushes and Tarte Blissful is more peachy and again matte. -> Fantastic staying power of 9-10 hours! Rating:- 4.5 out of 5! If you are a beginner in makeup and looking for a good affordable everyday wear blush I'd highly recommend this since its so versatile and can be worn during day as well as night time. The shade is one of the prettiest in my collection and absolutely must have! beautiful shade. Never tried blushes from Lakme, but I will try this one out :) Nice review Parita. definitely give this one a try..its stunning! this is the first time for me too Poo..def check out this shade! I so wanted to get my hands on this blush when I was in India, but those SAs and their stupid attitude... No matter what I asked for their answer was that Lakme has stopped making it and have replaced it with the 9-5 range... They kept pushing me to buy xyz product which I was not interested in whatsoever! Arghhh I hate those SAs, them and their funny looking green liner and blue eyeshadow! it'll look gorgeous on you Jas! beautiful shade...looks great on u! definitely check out Rashmi..the shade is stunning!